The scale and the potential for incidental damage to crops limit the usefulness of beneficial insects in the production of some vegetable crops, however. 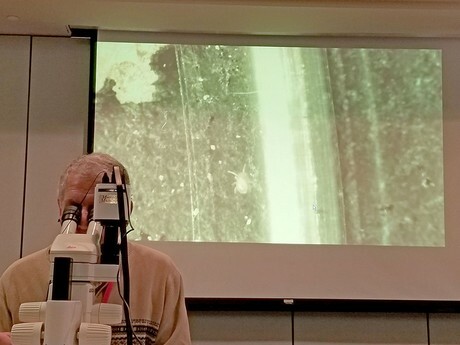 Professor and UGA Extension Entomologist Will Hudson projects images of a beneficial predator from his microscope during a presentation on beneficial insects. While many commercial growers use biopesticides in conjunction with traditional synthetic chemistries in outdoor field production, the use of beneficial insects for pest control is rising among producers using high tunnels and greenhouses. Practices such as strip-tillage preserve the habitat for beneficial insects and natural predators, as does planting cover or rotational crops like clovers, buckwheat, cereals and wildflowers, which also benefit pollinators. For more about controlling plant pests through biological control, contact your local UGA Cooperative Extension agent at 1-800-ASK-UGA1.